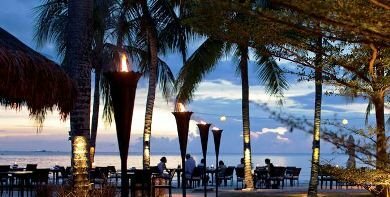 If you are looking for a romantic dinner having your toes dipped into the sand soaking in the latent heat of the sun while watching the magnificent sunset and having an exotic cocktail, you can consider La Sal at Casa Del Mar Hotel in Pantai Cenang, you can't go wrong. While there is also inside dining that starts at the room next to the piano and the wine bar with terracotta walls offering nice friendly yet classy ambience, the dining area extends to a canopy covered patio and then to the coveted area of open beach under the shadows of the swaying palms. Each white linen table on the sand with flickering torches is a secluded heaven for the diners. No wonder the hotel is named Casa Del Mar which stands for 'Home by the sea' in Spanish. Note that while La Sal is popularly known and referred as the restaurant, it actually is the cocktail bar and La Luna at Casa Del Mar is actually the restaurant. However, it is fondly and popularly known as the La Sal dining. The cuisine is a combination of western and local seafood and several other dishes. We would usually start with deep fried kataifi prawn crackles served with spiced avocado and mango salsa. This is complimented with cumin lim mayo giving a sweet-sour-tangy flavor... excellent! Another great starter is the tempura prawn with wasabi mayonnaise. Alternatively, go for the Australian beef fillet served with chive, mash, beans and watercress. This is complemented with hollandaise and shallot jus. Some of our favorite main courses at the La Sal are marinated rack of lamb served with potato curry, egg & cucumber raita (made in yogurt or curd) and further complemented with mango jam, or the seared tuna served with potato, beans and other vegetables. If you are fond of Malay dishes, then try out the Malaysian testing platter... you will get to taste a range of local delicacies. Finally we would finish with a home-made ice cream or a chocolate caramel tart. The roof covered patio can accommodate 35 guests and the beach area (palm grooves) has a capacity of 50. The average price range for Entrees: RM35 - 40; Main Course: RM35-80. 1) CDM Bellini - Prepared with fresh ginger mixed with Absolute & Lychee Liqueur and presented in a champagne flute. 2) 5 Spiced Poached Apple & Cinnamon Mojito - Raisin & Cinnamon are infused in Bacardi rum and mixed with fresh lime, mint leaves muddled with brown sugar & poached apple, then topped with Soda. 3) Tom Yam Martini - a super dry Martini prepared with lemongrass, galangal, kaffir Lime and ginger infused in Vodka combined with chili & coriander infused Vodka. If you are planning to make a marriage proposal or celebrate your anniversary, the La Luna experience on the beach can make it something that you won't forget. Casa Del Mar offers a package that includes degustation menu and selected premium wines, and will arrange the table for you in a secluded and exclusive area of the sand making it a very special evening. Serves breakfast, Lunch & Dinner. You should make a reservation in advance. Open daily from 7am. Last order at 10:30pm. Credit cards accepted. The restaurant is part of Casa Del Mar Hotel which is located right on the road Jalan Pantai Cenang. Ask anyone about the hotel in Pantai Cenang and you will know where it is.